Graham Young, Director of Bamburgh Castle Research Project, said: "Although it's a small trench, because we've seen rock-cut structural features elsewhere, we can fit that into a background. "We know it's occupied, it's written about in contemporary texts so it's fascinating to see the actual material itself, the archaeology." From the small trench, the teams discovered a posthole sealed over by a mortar spread right in the main bedrock of the castle. They believe it is a medieval floor surface and the posthole underneath could date back even earlier than medieval times. Mr Young said: "It's brilliant, it's a perfect excuse to go and actually look right at the heart of the fortress because you need a good excuse to go right into the very focus of everything and it fits in. "We've been there for quite a while now and it's very nice to get lots of external experts in and sort of see it through fresh eyes." 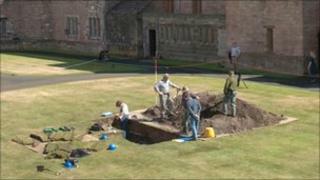 The Time Team archaeologists were at the site for three days. Mr Young said: "We expected it be be chaotic having a film crew arrive and we weren't disappointed in any way because it was. "They did an amazing job, much better than we could ever have done in reinstating the turf, which I'm sure Davie, who cuts the grass lovingly, was very relieved about." The show airs on Sunday, 24 April at 1730 BST on Channel 4. Medieval love epic in Bamburgh?